My friends, I still have muffins on the brain. I don’t know maybe I always have muffins on the brain. I really like muffins for breakfast. Another thing that’s going on at my house is that I’m really struggling to feed my youngest son. He seems to be lactose intolerant in the extreme, perhaps even truly allergic. Milk, cheese, yogurt, possible even butter seem to make him really sick. Of course I’m vigilant about keeping him away from milk, cheese, etc. But the thing you don’t realize is that milk or other milk products are in all kinds of prepared foods! Granola bars, breakfast bars, breads, frozen waffles, some cereals (even before you pour your milk on), fish sticks, frozen dinners, and many many other things I can’t think of this moment. I don’t use a ton of prepared foods. bBut I do use the occasional item to make life easier from time to time, and the place I use them most is breakfast. I do love making pancakes, eggs, waffles, whatever, for the kids breakfast now and again. But every morning? I don’t think so. A lot of mornings I prefer to grab the kids something quick and nurse my cup of tea or coffee in relative peace. I feel like I’ve done a decent job adjusting my own cooking to avoid milk and other dairy though it’s been challenging. (Cheese has been the hardest to avoid. 2/3rds of our favorite family dishes contain cheese! And don’t suggest soy cheese. That stuff is nasty. I wouldn’t inflict it on my worst enemy.) But the pre-made breakfast has stumped me. A lot of easy pre-made products have one of the forbidden ingredients. I’m sure I can buy things without diary, but I don’t seem to be finding what I want or its insanely expansive. I’ll buy some things, like frozen waffles. I’ve found a brand that tastes good, is dairy free, and is only double the price of normal waffles rather then triple or more. But obviously I still have a big gap going on so I’ve started working on dairy free breakfast recipes that I can make ahead of time and pull out for my little one in the mornings. Then I can still go hide with my coffee when I need to. 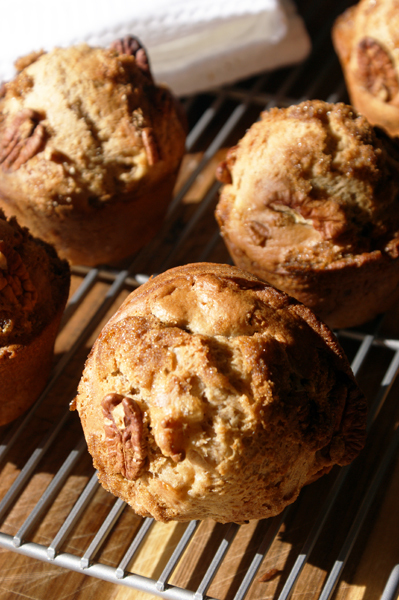 Apple Cinnamon and Pecan Muffins are winners. 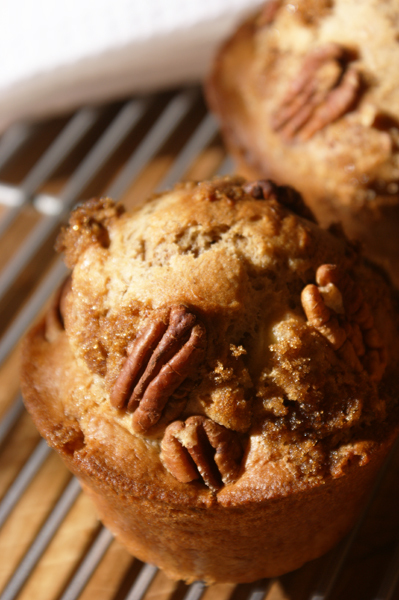 They turn out great with soy milk, moist, sweet, apple-y. But they don’t taste like soy milk so everyone in the house will eat them. (My oldest hates soy milk.) They store nicely for about a week in an airtight tupperware container. They come out nice is jumbo, standard, or mini sizes… Win-win, am I right? I should note that if you don’t have a dairy problem at your house you should feel free to make these with normal milk. They turn out great that way as well. Buttermilk or milk with some fat makes them particularly moist. I also need to give special thanks to Sally’s Baking Addiction for her Master Muffin Mix, which this recipe is adapted from. 1. Preheat oven to 425* for jumbo and standard muffins or 375* for mini muffins. Grease the muffin pan with spray oil and set aside. In the bowl of a large stand mixer add all dry ingredients: flour, baking powder, salt, brown sugar, white sugar, cinnamon, and allspice. Use the paddle to mix all dry ingredients well. 2. Add the wet ingredients: apple sauce, milk, eggs, canola oil, and vanilla extract. Mix very well to combine. The batter will have a smooth appearence when mixed enough. 3. Add the nuts and apple chunks. Mix gently to combine. Fill each cup of the muffin pan 2/3rd full. Lightly sprinkle with additional brown sugar and cinnamon. 4. For jumbo muffins bake at 425* for five minutes. Reduce heat to 375* (without opening the oven) and bake for an additional 18-20min. 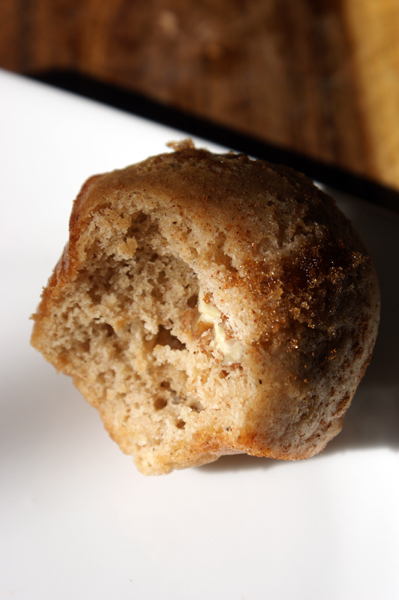 Or: For standard sized muffins bake at 425* for 5 minute. Reduce heat to 375* and bake for an additional 10-15min. 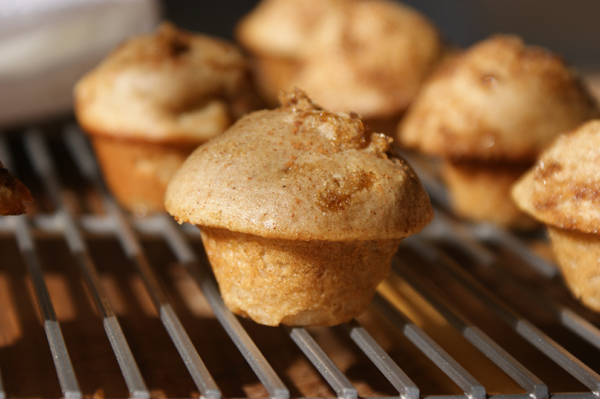 Or: For mini muffins bake at 375* for 10-12min. 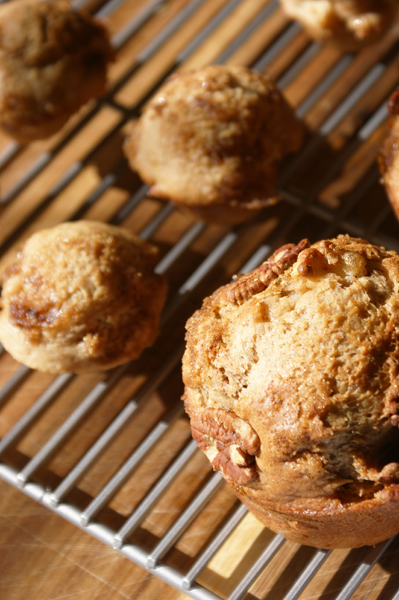 This recipe works very nicely with soy milk to make the muffins non-dairy.